November 25, 1877 – On the day before the Chicago City Council is to vote on an arrangement that would lease a part of the lakefront on the east side of Michigan Avenue and south of Randolph Street to the “Chicago Ball Club” [Chicago Daily Tribune, November 24, 1877] a letter to the editor of the paper, signed “Michigan Avenue” justifies the transaction with these points, “Inasmuch as the idea is to pay the city $1,000 for the use of some land for which it has heretofore received nothing, it would seem to be a worthy one; but the Aldermen should carefully satisfy themselves on these points: Whether there is a reasonable chance for the sale of the property for depot purposes; and whether the character of the petitioners, and of the officers of the ball club, is such as to guarantee good management. With no doubt on these points there should be no hesitation in taking the $1,000. The question as to the character of the attendance at ball matches cannot possibly be put by a Council which lets another portion of this same property for circuses. 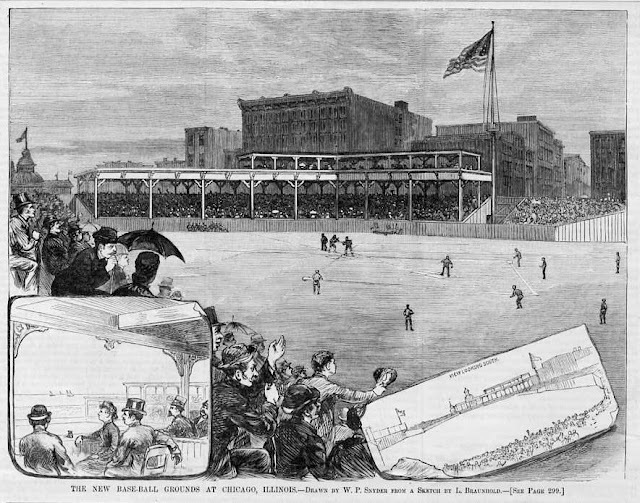 It is without doubt true that many good citizens in business and professions greatly enjoy, as an afternoon’s recreation to see the exhibition of base-ball, and there is no more reason why the City Government should discourage that entertainment than there is for the putting down the theatres by ordinance.” The team that would eventually grow into the Chicago Cubs would find its home where the Millennium Monument stands in Wrigley Square in Millennium Park today, building two playing fields in six years, moving to the West Side in 1884 for legal reasons. An interesting look at the earliest days of the team can be found in Connecting the Windy City here. The top photo shows a Harper's Weekly illustration of the second lakefront park in the spring of 1883. The photo below that shows the one-time park as it appears today, the site of Wrigley Plaza and the Millennium Monument. November 25, 1908 – Aaron Montgomery Ward issues a lengthy statement in which he reviews “in detail the administration of the self-appointed office of ‘watch dog of the lake front.’” [Chicago Daily Tribune, November 26, 1908] Far from being a manifesto, the statement is conciliatory, ending with these words, “If the South Park commissioners or the museum trustees can find a way to prevent other buildings from being constructed on the lake front in the future, then I will be glad to withdraw my objection to the erection of the Field museum, but if the dedications and the law affirming them are destroyed for one building, any other buildings may go there within the discretion of the body exercising the trust over the park.” Much of Ward’s statement details the history of what we know today as Grant Park, a history that begins in 1836 when the United State cedes all of the land from the river to Twelfth Street and from State Street to Lake Michigan to Chicago so that the city can raise funds through the sale of those lands in order to build a canal. The city platted the land from Madison Street to Twelfth and From State to the lake into lots and public grounds, and on the public ground east of Michigan Avenue the maps carried the words, “Public ground, A common: to remain forever open, clear and free of any building or obstruction whatever.” Three years later the federal government platted the land to the north, previously occupied by Fort Dearborn, in the same way and on the public ground east of Michigan Avenue appeared the words, “Public ground: to remain vacant of buildings.” The principle purpose of the designations seems not to have been one of altruism, but of business. 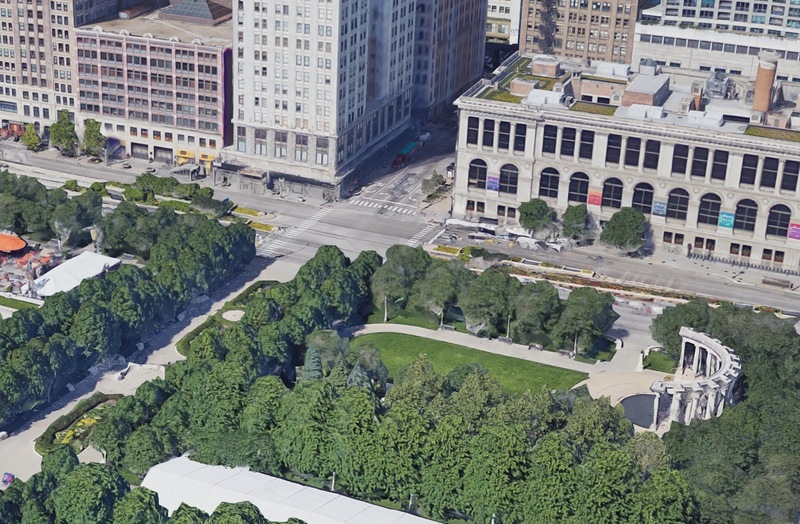 Creating a large area of open space across from the little-used mud path of Michigan Avenue would induce buyers to purchase land in one of the least attractive areas of the central city. It didn’t take long for the city to begin ignoring the responsibility to maintain its open land. Ward details the encroachments that the city sanctioned, “By its permission the old exposition building was erected just north of Jackson street. North of that was erected an armory building, and north of that building known as ‘Battery D.’ Still north of that and in the rear of those buildings, were erected barns and sheds to stable the horses and wagons used by the city in cleaning the streets from the river to Twelfth street, and from the river to Lake Michigan, and to pile old paving blocks and other material, and for other sheds. 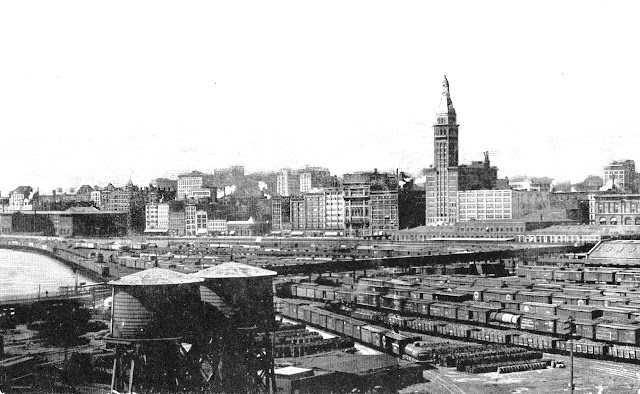 It gave permission to the Baltimore and Ohio railway company to erect and maintain sheds where freight was unloaded form the cars into wagons. Different express companies were given like privileges. There were five railroad tracks on the park west of the Illinois Central’s right of way. The city gave permission to different circuses to show on the lake front for two or three weeks at a time, the circus horses and other animals were stabled upon the park, and when the circus left the debris and offal remained, an offensive nuisance to everybody in the vicinity. During the winter the snow taken from the streets, together with all the dead dogs, cats, rats, or other animals and garbage that might be thrown into the street was all dumped on this park. The snow and filth taken from the streets remained there until the heat and the rains of spring and early summer melted the snow and ice and left in its place the slime and filth and dead animals, and that condition remained until the property owners were forced to clean the place at their own expense.” By 1890 the area was in such deplorable condition that Ward went to court to obtain a restraining order against the further use of the park other than its original condition as open space. The case ultimately ended up in the Illinois Supreme court, which found in Ward’s favor … “that neither the legislature of Illinois nor any other body could grant to the state or any one else the right to violate the dedication of the federal government and the state government.” Then Ward turns to the proposed Field museum, saying that -- ”Nobody had a higher respect or admiration for Marshall Field during his lifetime or his generosity in donating a large sum of money for a museum than I have.” He continues, though, saying that the South Park Board proposes much more than a museum on the park, proposing “to erect four public comfort buildings, a building for the storing of tools, an electric light power plant, sheds for the storing of water and sprinkling carts, stables for horses, a band stand, a boathouse, a refectory or restaurant building, an administration building or office building for the officers of the park board. In other words, their plan is to provide a site on the lake front for twenty or more permanent buildings, not including the Field museum.” Ward finishes his statement with words that are prophetic, “I may add that it has been my purpose to preserve the Lake Front park for the people in accordance with the plain intent of the government which gave to the city the land for an open park, free from all buildings, and I am still of the opinion that in so doing I have done the city and the people a real service.” In the above 1908 photo the tallest building is the headquarters building for Montgomery Ward. It is clear that the eastern view from its windows did not provide a scene of serenity and calm. November 25, 1900 – The Chicago Daily Tribune reports that General Henry Strong has bought the Lincoln Park Palace on the northwest corner of Diversey Boulevard and Pine Grove Avenue for $75,088.76. The Palace was completed in 1893 as a “high class apartment building and hotel”. [Chicago Daily Tribune, November 25, 1900] The building reportedly cost $200,000 to construct and the sale came about as a result of a suit General Strong filed against Mrs. Mary Edwards, the wife of the developer, C. C. Edwards, who fell from the top of the building as he was inspecting the progress of its construction. Mrs. Edwards supervised the completion of the building, but it never saw anywhere close to a return on the money that was invested in it, and she took up residence just to the west. If you happen to stop by Yak-Zies on Diversey, you are in the former home of Mrs. Edwards, so order up a drink of your choice and offer a toast to poor old Widow Edwards. She deserved better than she got. 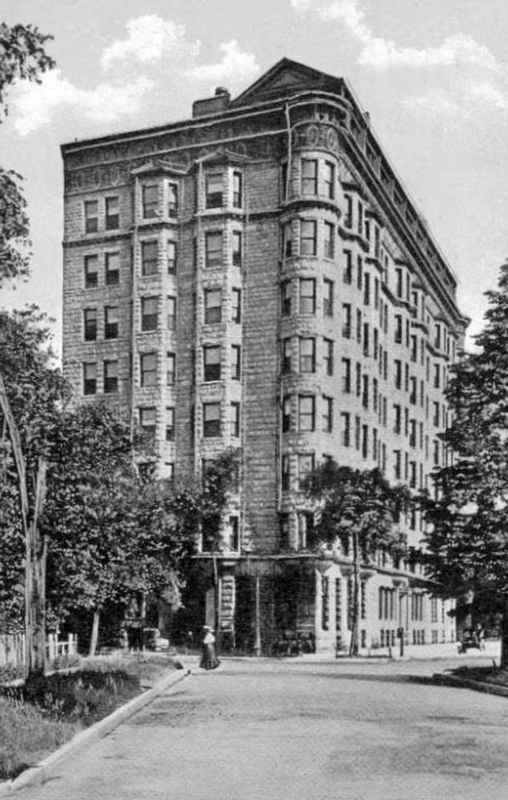 The Lincoln Park Palace still stands today as an apartment building, The Brewster, with an unbelievable atrium that rises to the full height of its eight stories. Glass block walkways on each floor allow light to travel from the roof’s skylights to the vestibule as they provide access to the apartments. For more information on the Brewster and its fascinating history, please click here.